This stack is for when you really need your brain on your side. It’s not something you’d want to use daily, but rather something you’d pull out for special occasions, where you may need the entire day and night to get things done. Taking one capsule of each component of this stack will keep you awake and focused for 5 to 8 hours. This is a very powerful stack, which you want to take once per week at most. It is advised to take it easy the day after in order to recuperate from the mental exertion of the day before. Adrafinil gets turned to Modafinil in the body. 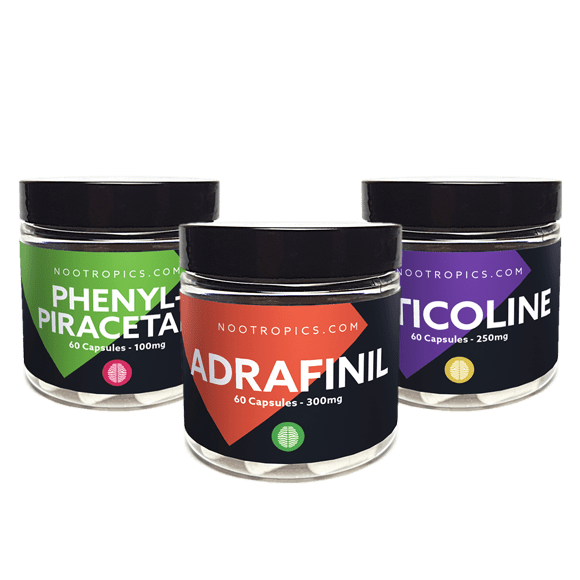 Modafinil is what shot nootropics into the public eye, with university students using it to increase their focus, cognition, energy, and memory. Phenylpiracetam is usually used for motivation to start tasks. It makes it easier to get started on things, improves cognition and concentration, and reduces stress. Combining this with Adrafinil will set the stage for an intense workday. Citicoline has modest cognitive benefits by itself, but the main place where it shines is in combination with Phenylpiracetam. The latter interacts with the brain’s acetylcholine system, and taking Citicoline potentiates this effect. It also prevents the headache that can be brought on by Phenylpiracetam’s interaction with the acetylcholine system. Capsules per day: 1 of each, up to twice in a day. Effect duration: Peak effects for 5 – 8 hours, with residual effects up to 10 hours after that. Extended use: This stack is not meant for extended use. Take this once a week at most. Do not consume alcohol if you have taken Adrafinil or Phenylpiracetam.